Following the arrival of Conan earlier this week, I took the game along to the Meeples Bunker last night so that Dave and I could have a closer look and try a game. Much has been made on various forums recently about how poor the rulebooks for the game are. Yes, there are a few issues, but nothing that is insurmountable without applying a modicum of common sense and a little Google-Fu. If you read some posts, you would believe that the game is unplayable – far from it! As with most people, we played the first scenario: “In the clutch of the Picts”. I was playing the Overlord, whilst Dave played all three Heroes. I was wondering how this would work (the game is designed so that each hero character is run by a different player) but in practice it runs very smoothly – in fact, it’s probably easier with a single player as there is no need for discussion of tactics between players, with the ensuing potential for misunderstanding and chaos. So, what type of game is Conan? Essentially, it’s a miniature skirmish game using zone movement. Each Hero has a character sheet, and this is used in conjunction with ‘Energy Gems’ to decide what actions you are performing. Icons identify actions: The axe is melee attack, the target is ranged attack, the shield is defence etc. In order to perform actions, you move gems from your reserve area (1) to the skill. You have a limited number amount of energy, and you also recuperate energy differently depending upon whether you are active or passive (resting). Energy is also used to track your health – take wounds and you lose those energy gems permanently (unless you drink a healing potion, or get healed via a spell) – this mechanic represents the debilitating effects of wounds in simple and effective way. Think of ‘Energy’ as ‘Action Points’ and anyone who has played a recent miniatures skirmish game will pick this up in no time. A Hero turn lasts until the Heroes have performed all the actions they desire – you can spend as little or as much energy as you wish, up to the number of gems in your reserve. Once the Heroes have finished, the Overlord plays, using a similar, but simplified mechanic. You activate up to 2 units a turn using gems, and each activated unit can move, fight and cast spells. The cost of this activation is dependent upon the unit’s position in ‘The River’. As units are activated, they are moved to the right hand side, so activating different units each turn keeps the energy cost low, It is possible to activate a unit multiple times in the same turn, or on consecutive turns, but the cost of doing so increases. Gems can be spent in order to give bonuses such as moves, or dice re-rolls. Again, each turn a limited number of gems are replenished (dependent upon the scenario). Games are scenario based – there are 8 in the initial game, plus a number of bonus scenarios included in the Kickstarter package. Scenario difficulty can also be adjusted by amending how many energy gems the Overlord gets each turn, and how many gems are replenished each turn. In short, we loved it. The ‘Energy’ mechanic works really well – it’s a constant trade off and challenge between what you are trying to achieve each turn, and looking at what you may need to do on the following turn. Do you exhaust all your energy, knowing that you are going to have to rest next turn, but with the knowledge that a group of the enemy is bearing down on you? I fully expect that the tabletop games that we have been playing, such as Chain of Command’ and ‘Saga’ will be interrupted on a regular basis by this game! At this point only one question remains – do I really have to paint all this plastic? 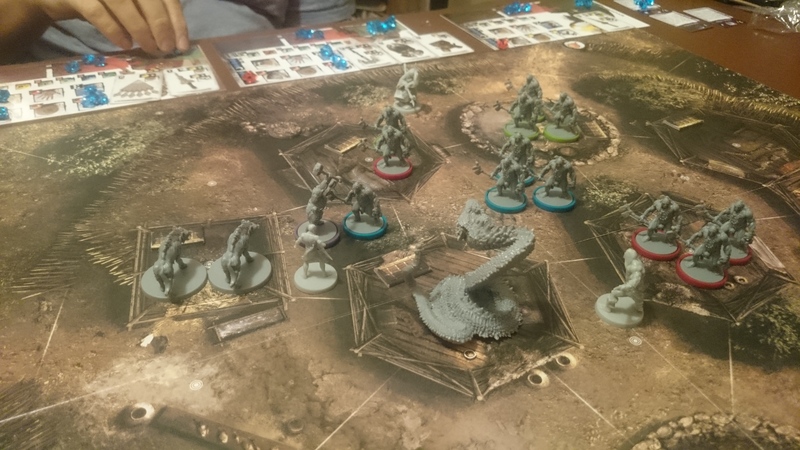 Since Stuart was still in hot lava meltdown from receiving his big box, we played this on Wednesday, even though I was gently joshing him about getting all the figures painted first. I liked, rather than loved it. We just about got out with the bint and the head, though the big fella was dangerously close to being killed. The models are good, some very good. The energy system works well. Combat is OK, nothing hugely innovative and the dice are naff. The board is well-drawn but area movement seems gamey, would prefer table-top.